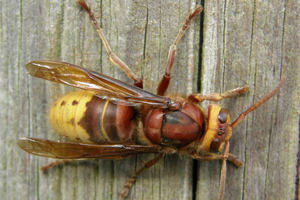 Hornets (insects in the genera Vespa and Provespa) are the largest of the eusocial wasps, and are similar in appearance to their close relatives’ yellow jackets. Some species can reach up to 5.5 cm. 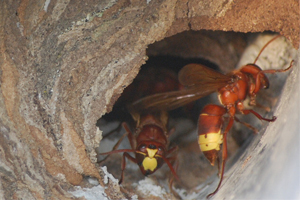 Like other social wasps, hornets build communal nests by chewing wood to make a papery pulp. Each nest has one queen, who lays eggs and is attended by workers who, while genetically female, cannot lay fertile eggs. Most species make exposed nests in trees and shrubs, but some (like Vespa orientalis) build their nests underground or in other cavities. In the tropics, these nests may last year-round, but in temperate areas, the nest dies over the winter, with lone queens hibernating in leaf litter or other insulative material until the spring. Hornets, like many social wasps, can mobilize the entire nest to sting in defense, which is highly dangerous to humans and other animals. The attack pheromone is released in case of threat to the nest. In the case of the Asian giant hornet (Vespa mandarina) this is also used to mobilize many workers at once when attacking colonies of their prey, honey bees. 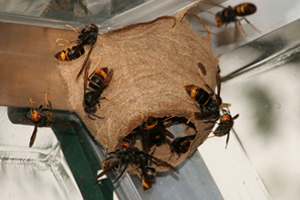 If a hornet is killed near a nest it may release pheromones which can cause the other hornets to attack. Materials that come in contact with this pheromone, such as clothes, skin, and dead prey or hornets, can also trigger an attack, as can certain food flavorings, such as banana and apple flavorings, and fragrances which contain C5 alcohols and C10esters.